If you were bullied as a kid, you know that having adults stand up to protect you from abuse is basically a coin flip. Sometimes a teacher or administrator will step in and address the problem. Sometimes they shrug and say the kids need to sort it out for themselves. Sometimes the bullied kid tries to fight back and they’re the ones who get punished; because two wrongs don’t make a right, or you can’t fight hate with hate, or whatever BS justification adults come up with. The result is the same— when kids are abused by their peers, those with the power to stop it often choose not to. This dynamic has a habit of persisting into adulthood. Ask Muslim folks who try to talk about the Islamophobia they experience and are greeted with silence. Or ask a gay individual who fights back against a homophobe only to be criticized because “you can’t fight hate with hate.” Or ask a victim of sexual assault, trying to seek justice while authorities and family and friends are inclined not to believe them. Or, you know, look at the comment section on any article about Black Lives Matter. Which brings me to Sulley Muntari. The 32-year-old currently plays for Pescara, who are stuck at the bottom of the Serie A table and are almost certainly getting relegated at the end of the season. It’s a bit of a drop for someone who won Serie A and Champions League titles with Inter Milan and the FA Cup with Portsmouth. But at his age, and with his international career with Ghana over, there are only so many options for Muntari to keep his career going. While his career options may be limited at this stage, he certainly didn’t deserve the treatment he received yesterday. 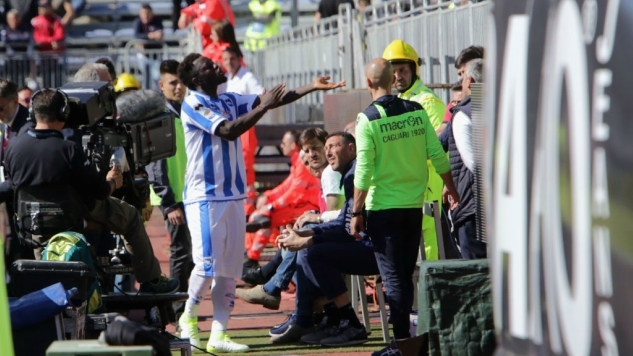 During yesterday’s league fixture against Cagliari— which Pescara ultimately lost 1-0— Muntari was subjected to racist abuse from some fans, which included a group of children. This is something of a regular occurrence in Italian football. Unwilling to stomach it further, Muntari spoke to the referee and asked him to do something about it. The official was unmoved by Muntari’s plight and told him to carry on with the match. When Muntari insisted he do something about it, he was shown a yellow card. For dissent. Because nobody like a tattle-tale, apparently. In response to the referee’s staunch refusal to do anything about the abuse, and following the example set by Kevin Constant and Kevin Prince-Boateng years ago, Muntari walked off the pitch. But not before giving his shirt to one of the children in the stands who was hurling racist invective at him during the match. Pescara manager Zdenek Zeman told reporters are the match that while it’s unfortunate that he was subject to racist abuse, Muntari was ultimately in the wrong for walking off the pitch. Which is… an incredible thing to say in public, but that’s where we’re at. The Italian Football Federation has yet to issue an official response. There are guidelines governing how racist abuse incidents are to be handled, but given that the Federcalcio’s current president was once suspended by UEFA for six months for racist comments, don’t be surprised if nothing happens. It’d be easy to look down our nose at Italian football and the culture of unrestrained bigotry there, but this problem isn’t confined to Serie A. Mario Balotelli continues to experience racist abuse in Ligue 1. Bundesliga clubs are playing whack-a-mole with racism in their stands. In England, there are usually some supporter bans (if individual fans are caught) and small fines leveraged against clubs— followed by columnists and bloggers defending the abuse as “banter” while the abuse continues in the affected player’s Twitter mentions. Unless and until football authorities at all levels are willing to take this problem seriously, players will continue to be on the receiving end of horrible abuse.